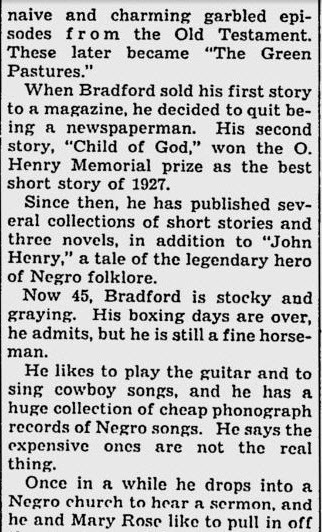 As a black folklorist, I’m currently reading some of Bradford’s works. “Uncle Wes” was Pastor John Wesley Henning, who Bradford credited with telling humorous and imaginative Bible stories that inspired much of his work. His collections of this genre, “Ol Man Adam” and “Ol King David & The Philistine Boys” are amusing and occasionally profound if you are not too sensitive to such things. However, recordings of actual Southern black preachers of this era show that he wasn’t really far off the mark with these stories. 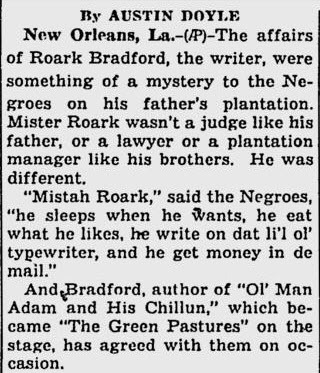 Critics argree that the best (if lesser known) of his works was “The Green Roller” (published postumously in 1949) where he caputes the black sermons more reverently and with less dialect. Oh, and catch “The Green Pastures” (based on “Old Man Adam”) on DVD. Thanks for commenting and providing me with the identity of Uncle Wes. I’ll be sure to check out some of Bradford’s writings so I can better form an opinion of him. 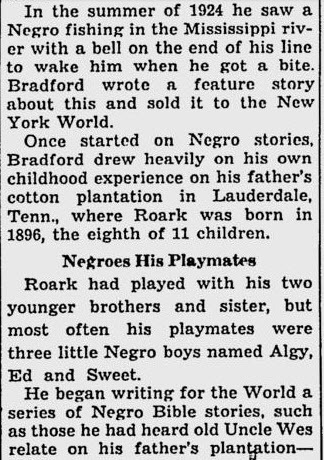 Since you are a black folklorist have you come across any other authors who got inspiration for their stories from Blacks in TN? You may want to check out the WPA Slave Narratives (interviews with ex-slaves in the 1930s) from Tennessee, which are available online. I would also suggest the recordings of black preachers of the 1920s and 30s such as Rev. J.M. Gates (from Georgia), and others on Document records on amazon.com. Incidentally, the legendary comedian Mantan Moreland recorded an album in 1963 of Bradford’s stories in “Ol Man Adam and his Chillun.” I’ve recently ordered it from ebay.